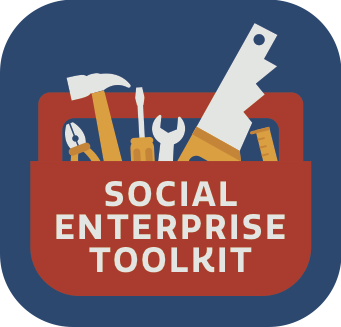 When you start out with your social enterprise, you will need to know your customers and who you are trying to service. It is important therefore to have an idea on how to get the message to people who will buy your product and services. We will look in greater detail into this process in this chapter but first it is important to know the concept of a marketing and sales funnel. A marketing and sales funnel describes how a customer finds you and what process they go through to purchase from you. First let’s tell the difference between sales and marketing. Awareness – at this stage, the potential customer or prospect, learns about your existing solution, product or service. They might also become aware of their problem that they need to solve and the possible ways to deal with it. This is when they visit your website or your premises for the first time, which they found from an advertisement, search online, a post shared on social media or some other source. Interest – at this stage, the prospect is actively looking for solutions to their problems and ways to achieve their goals. This is when they are specifically looking for something. This is when you can attract them with some great content. This is the time when they expresses an interest in your product or a service. Decision – at this stage, the prospect is making the decision that they want to take advantage of your solution. They are paying more attention to what you offer, including different packages and options, so they can make the final decision to purchase. This is when sales offers are made by using whatever your sales techniques are. Action – at this stage, the prospect is becoming a customer by finalising the deal with you. They are signing the contract or clicking the purchase button. Then the money is transferred to your bank account. It’s important to state that there might be additional stages to your sales funnel. Your customers might become brand advocates and bring more business that way. At the same time, they might buy again from you and become loyal customers. Let’s focus on the awareness part of that funnel and seek out more information on your own social enterprise. Social enterprises can’t trade on social values alone; they have to be commercially competitive in terms of quality, innovation, performance and price. It is important for social enterprises to understand their industry and sector – firstly, the needs of the consumer and secondly, the current competitive offer. To compete they need to effectively differentiate themselves and raise the benchmark of their product or service in terms of quality and performance as well as ethics to successfully win customers. Here are some questions that we will need to ask ourselves before we start? Test yourself by writing down the answers to the questions on the next page. 3.3.1 Why do I need Market Research? Now that your social enterprise is defined through a mission and vision, the next step is market research. Market research is the process of gathering and analysing consumer and economic data to help you understand which products and services your customers want, and how to differentiate your business from your competitors. Before launching your venture idea, you want to have a good picture of who your potential customers are, who your competitors are, what the economic conditions of your marketplace are and what is the size of your marketplace. This will help you identify sales opportunities, develop a plan of action, spot current/upcoming problems in the market, and reduce risks. The market research you conduct will help you to make informed decisions about your business. 3.4 Who are your customers? We define customers or clients within this toolkit as people or organisations who will pay for your services or products. What we are looking for here is to try and narrow down your ideal client. For example, a client type could be local authorities, businesses, hospitals, schools or individuals. Depending on what you are selling, these will generally be two different approaches. They differ in a number of ways. For example, you could sell 1,000 cakes that you make in your social enterprise, to 1,000 individual customers or you could sell 1,000 cakes directly to one business who will resell them for a profit. Both sell 1,000 units, but they will be very different experiences for the business and the general public. People can often make the mistake in thinking that the world and everyone in the world is a potential customer. However, this is not usually ever the case. Take for example someone developing an app. It could be argued that anyone with a phone is a customer and your business reflects that you will sell that app to everyone which helps you with a sales target. However, think of all of the things that need to happen for someone to pay for your app. See the next page for some observations on an app. 3.5 How can I do some Market Research? Market research informs how you design your organisation and your products and services from the initial stages to completion. Market research should be part of your business planning process and continual innovation process. Primary research shows that you have spoken to and engaged the views of your potential clients to co-design your products and services. Qualitative data is descriptive evidence that gives explanations – for example, client testimonials or other customer feedback. Quantitative data is numerical evidence that presents statistical figures to the reader – for example, the number of people who said they would be interested in your product or service, or % of replies that agreed to a statement. Product – What are you offering to the customer? Price – What do you need to charge to supply the product or service? Place – Where is the customer going to ‘shop’ for your product? Promotion – How are you going to encourage customers to buy your products? A product is an item that is built or produced to satisfy the needs of a certain group of people. The product can be intangible or tangible as it can be in the form of services or goods. You must ensure to have the right type of product that is in demand for your market. Marketers must also create the right product mix. It may be wise to expand your current product mix by diversifying and increasing the depth of your product line. All in all, marketers must ask themselves the question: “what can I do to offer a better product to this group of people than my competitors”. Placement or distribution is a very important part of the product mix definition. You have to position and distribute the product in a place that is accessible to potential buyers. This comes with a deep understanding of your target market. Understand them inside out and you will discover the most efficient positioning and distribution channels that directly speak with your market. The price of the product is basically the amount that a customer pays to enjoy it. And it is very important to get right. Getting the price right will mean that people will purchase your product generating profits for the social enterprise to allow it to carry on its mission. Too low, people might buy, but you might not be making a profit. Too high and you might make a profit but no-one might buy it at that price. It is important that you have done your research as if it is your first time selling into this market, you might struggle to differentiate yourself from established competitors. This might mean that people may choose to purchase at a reduced price which can threaten your organisation. Think on whether you are going to be the cheapest in the market or the best value or are you going to be a premium product. As an analogy, are you a cheap no frills airline or are you a 5 star airline? Advertising usually covers communication methods that are paid for such as television advertisements, radio commercials, print media, social media and internet advertisements. Public relations includes press releases, exhibitions, sponsorship deals, seminars, conferences and events. Word of mouth is an informal communication about the benefits of the product by satisfied customers and ordinary individuals. The sales staff plays a very important role in public relations and word of mouth, as do customers and increasingly, online reviews. Getting to know your competition is a tough nut to crack sometimes. But be mindful of the people who others will see as competitors to you. They might be new or existing organisations. What you are looking for is comparisons. There are always differences. For example, if I want to buy coffee, I can buy a machine coffee from a local filling station, a barista coffee from a café or an expensive coffee from a hotel foyer. Each is almost completely different, but all offer prices, experiences, service differences and offerings to drink coffee. Be careful not to discount why people use each location and figure out which group you are trying to attract and why. Take it that you are building a new café for your community. Go through the grid and figure out what might make you different. Strengths – internal attributes and resources that support a successful outcome. Weaknesses – internal attributes resources that work against a successful outcome. Opportunities – external factors the project can capitalize on or use to its advantage. Threats – external factors that could jeopardize the project. Once the SWOT factors are identified, decision makers should be able to better ascertain if the project or goal is worth pursuing and what is required to make it successful. What do you consider your strengths to be against your competitors? What do you consider your weaknesses to be against your competitors? What do you consider your opportunities to be against your competitors? What do you consider your threats to be against your competitors? Your communication tools should neatly describe the services and products you are offering to your audience. When you are starting out, it is easy to be over-ambitious and list many things on offer. However it can be better to establish your organisation within a few niche services or products that will distinguish you from your competitors. Once you have established the interest and relationship of your audience it is then time to start selling additional services or products to them. The website should have a web analytics tool to measure number of visits or page views or pages visited etc. You will need to set performance targets for each of your KPIs so your marketing team has focus and clarity on what success looks like, and progress will need to be monitored each month. The sales process kicks in as soon as the marketing strategy has attracted someone’s attention. At this point it’s time to develop the relationship and hopefully close the deal. Depending on what marketing channel you are using, the nature of your product or service, and the information you offer at the marketing stage, the sale might happen straight away or you might need to engage and speak to the customer to convert the sale. The nature of the sales process will vary amongst industries, products and services. On all fronts, the sales process needs to be fluid and easy for a customer to navigate through. If it’s too complex or time consuming it’s quite probable that you will lose the customer. You will need to measure your sales. These will be the lifeblood of your organisation and it is important to measure those sales against the expected sales you were expecting to bring in. The main reason for measuring is to see if there are ways to improve in future. Once you have defined your sales targets over a certain time period you can work out the potential sales income that you are likely to generate using your product’s price point. These figures will feed into your financial planning. You can break those targets down still into further pieces by assigning certain people, by focussing on particular types of clients or even a particular geography.